Does Climate Change Cause More Severe Storms? NOAA Says Yes In Louisiana But Not in Colorado. Canada Mixed? 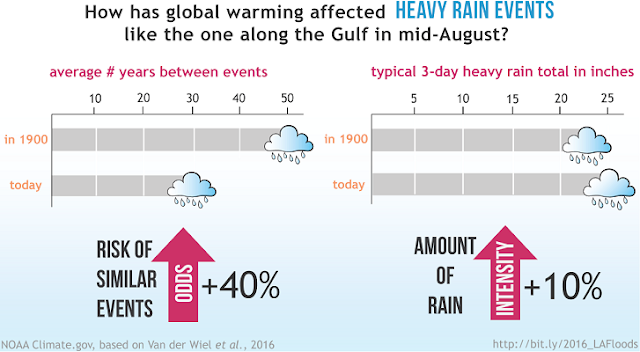 The 2016 extreme rainfall in Louisiana has been deemed by NOAA to be more likely and severe due to change climate, while the 2013 extreme rainfall in Colorado has been deemed less likely. Why the different behaviour? Like in real estate, its all about location, location, location. Trends are not uniform across the entire continent - Louisiana is influenced by the Gulf of Mexico, and Colorado isn't. The 2016 Louisiana rainfall event dropped more than six inches of rain in some regions August 11, 2016 and Baton Rouge received over 11 inches of rain August 12. Such an event has been analyzed to be more likely, with a shorter 'return period', meaning a higher probability of occuring. Specifically the 2016 Louisiana storm was assessed to have a 30 year return period today (i.e., 1/30 = 3.3% chance of occurring), while only a 50 year return period in the past (i.e., a lower 1/50 = 2% chance of occurring). Details are here. Louisiana rain frequency shift - 3 day rainfall. Details are on the NOAA website, including the graphic above. But a NOAA-led study published in the Bulletin of the American Meteorological Society indicated that "The probability for an extreme five-day September rainfall event over northeast Colorado, as was observed in early September 2013, has likely decreased due to climate change." That storm dropped 17 inches of rain. not increase in the simulations but substantially declines in northeast Colorado (Fig. 5.2c). 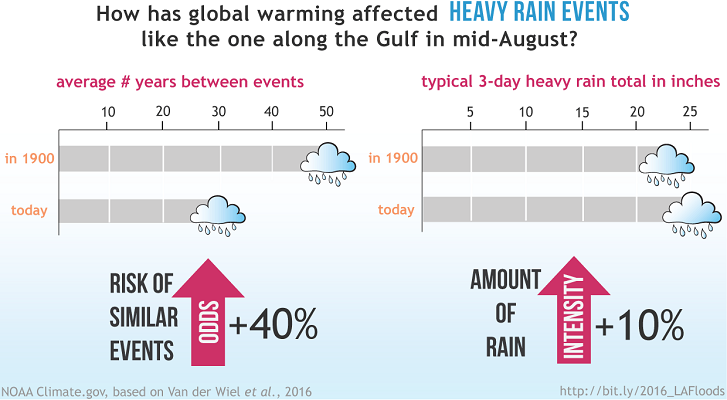 Using the model’s 95th percentile of five-day rainfall totals, we find a 12% decline in occurrence during recent decades compared to the late 19th century." during summer is also projected (Sillman et al. 2013), emphasizing that global and annual perspectives of climate change may not always pertain to events at a specific place and time." How to Interpret: "Trend magnitude (triangle size) and direction (green = increasing trend, brown = decreasing trend) of annual flood magnitude from the 1920s through 2008. Flooding in local areas can be affected by multiple factors, including land-use change, dams, and diversions of water for use. Most significant are increasing trends for floods in Midwest and Northeast, and a decreasing trend in the Southwest." "The analysis of the precipitation indices for 1950–2003 reveals more days with precipitation, a decrease in daily intensity and a decrease in the maximum number of consecutive dry days." "Both the southwest and the east (Newfoundland) coastal regions generally show significant increasing regional trends for 1- and 2-hour extreme rainfall durations. For the shortest durations of 5–15 minutes, the general overall regional trends in the extreme amounts are more variable, with increasing and decreasing trends occurring with similar frequency; however, there is no evidence of statistically significant decreasing regional trends in extreme rainfall amounts. The decreasing regional trends for the 5- to 15-minute duration amounts tend to be located in the St. Lawrence region of southern Quebec and in the Atlantic provinces." The data shows, for example, decreasing very short duration and longer duration trends at Toronto Pearson Airport (5 minute, 6, 12, 24 hour), but increasing mid duration trends (10 minute to 2 hour). Ottawa has decreasing short duration trends - suggesting less severe urban flooding potential - and increasing longest duration trends. In Southern Ontario, the increases in extreme rainfall are generally over longest durations (6, 12, and 24 hours) that is not critical for urban flash flooding - in contrast, the shortest duration trends show decreasing extreme rainfall.